Abstract design features in the future lobby play into the “things familiar” and backyard ideas. The blue wall represents an abstract fence. The design team is also working on large tree sculptures and a ceiling sculpture element to symbolize a tree canopy of leaves. Where does a child’s adventure begin? The answer: In the child’s backyard. The idea was to inspire imagination while being comfortable and safe at the same time – like in a child’s backyard. The theme was a result of a visioning process between HKS Architects and hospital leadership. The theme meets hospital leadership’s desire to create a place that’s distinctive and serves as a beacon to the community. It also conveys a connection to the natural environment, and inspires creativity and hope. Each department in the new building will feature a backyard-related design that drives the building’s interior look and feel. These themes will be reflected in abstract design features appropriate to the departments, and each floor will have an assigned a color, signage and accent walls that fit the themes. ED is “the puddle.” This theme was chosen because water has a calming effect for this high-stress environment. The first floor ED will be blue. The outpatient surgery center is “the sandbox.” Located on the new building’s 3rd floor, outpatient surgery will have a more energetic orange color scheme, reflected in color, texture and pattern. The high-risk delivery area, located on the 4th and 5th floors, will be “a garden,” which is appropriate and restful for this adult audience. 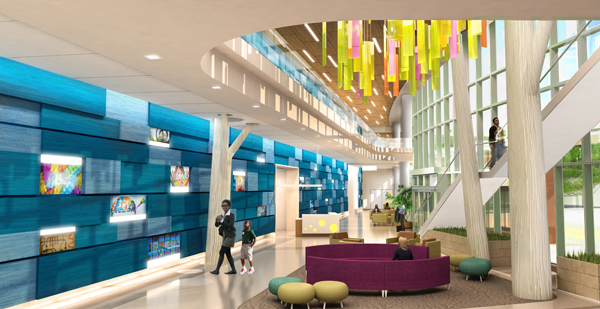 The NICU, also occupying two floors (the 6th and 7th), will create the feeling of “a treehouse.” One floor will be the treehouse at night, using the color magenta and setting the scene for a camp-out or sleep-over. The 2nd floor will be green, to reflect the feeling of spending the day in the tree tops.